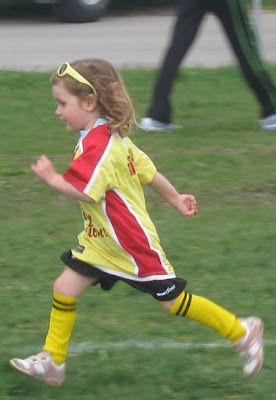 Rosie started soccer last Saturday. When the game began and someone else scored the first goal, she turned to us and began to wail that she wanted to do that. So I took a second to explain to her how it worked and said simply that if she wanted to do it, get a goal, this is what she had to do. And she did, 4 times (once in other team's net)! 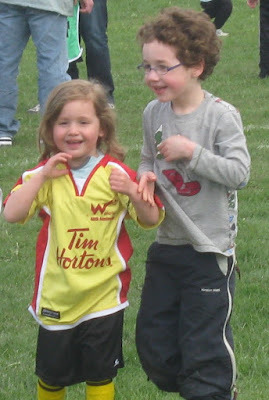 Scott and I were doubled over laughing because we couldn't believe it, while William ran around cheering her on. He even made her a medal when we got home. Maybe she'll love it or maybe the whole thing was a one off - we'll have to see. But regardless, it made for a perfect happy Saturday.